The ex-world chess champion Dr. Emanuel Lasker was greeted by hundreds of fans when he arrived at Chicago's Dearborn street train station on the afternoon of Saturday, February 20, 1926. The ex-champions arrival and reception was duly reported in the February 22nd edition of the Chicago Daily News. "That the man who held the title of chess champion of the world for twenty-six years was deeply moved by the sincerity of the ovation given him upon his first appearance in Chicago since winning the New York international and securing the runner-up position at Moscow, was evident by the glistening of his keen brown eyes and his smile of appreciation"
S. D. Factor, city and state champion, and "Sir Knight" (Sir S.S. Bell), chess editor of the Chicago Daily News, as well delegates of the various chess club throughout the city. 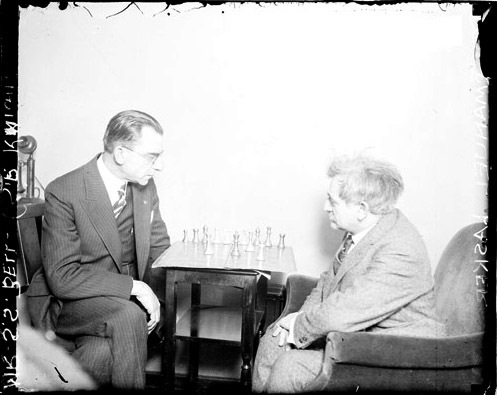 Later that evening, Lasker would give a simultaneous exhibition at the rooms of the Chicago Chess and Checker club against thirty opponents, the ex-champion won 28 games, Charles Elison and J. M. Juran were the only players who managed to draw their games against the ex-champion. Lasker had set sail from Hamburg aboard the steamship Cleveland, and had arrived in New York on January 19th, the ex-champions tour will him take him as far west as Seattle. Chicago would twice host the ex-champion during his current tour. On the 23rd of February, at the Hamilton club, Lasker faced thirty-two opponents, including four former Illinois state champions. The gymnasium of the Hamilton club was packed with hundreds of Chicago chess fans, who saw the ex-champion victorious at twenty-six boards, two games ended in draws and four opponents "compelled the doctor to lay down his king." The simultaneous exhibition was followed by a dinner at the Hamilton club and speeches. "Sixty covers were laid at the dinner given in honor of Chicago distinguished visitor by the chess section of the Hamilton club. Introducing Dr. Lasker as the man who had held the world's championship at chess for twenty-six consecutive years, the master of ceremonies, M.S. Kuhns, told of his own visits to Berlin, Heidelberg and other university cities of Europe where, much to his surprise, he discovered the eminent doctor was even more largely recognized as an author, linguist, traveler and philosopher than he was as a master of chess." Lasker's stay in Chicago ended with a simultaneous exhibition at the City Club of Chicago on February 26th, the ex-champion contested games against thirty local players. The doctor won twenty-five games, lost two games, and three draws.
" Two of the games contested last night without sight of the board or pieces by either the exhibitor or Mr. and Mrs. T.R. Gundlach, who opposed the doctor in this event. Both their games resulted in draws." "Lewis J. Issacs and Donald Kirk covered themselves in glory by compelling Dr. Lasker to lay down his king. The former Illinois champion [Issacs] offered a brilliant pawn sacrifice at the thirty first move and scored a beautiful victory...."
The Kirk game given below was annotated by the winner. The ex-champion left Chicago to continue his tour of the country, but would return to the city for a brief stop in April. During his first stay in Chicago, of the current tour, Lasker had won eighty one games, had had seven drawn games and forced to lay down his king six times. The ex-champions imminent return to Chicago was announced, in the April 2nd issue of the Chicago Daily News. "Dr. Emanuel Lasker will return to Chicago Wednesday , April 14, as the guest of the City club, at which time he will give an exhibition of his ability at rapid play. On this occasion the German master will tackle ten of Chicago's expert players, using time clocks, permitting his opponents twenty moves an hour, while the former world's chess champion will be obliged to make 200 moves each hour or forfeit his games. The players selected to meet Dr. Lasker in this event are Factor, Hahlbohm, Isaacs, C.W. Phillips, Dr. Phillips, Sparrow, Norris, Addlemann, Margolis, and Elison." The April 14th, City club exhibition was to be Lasker's last public apperance in Chicago before his departure home to Berlin. A dinner, followed by a lecture by the ex-champion procceeded the simultaneous exhibition. The ex-champion won six games, drew three games and lost one game; under the handicap of having to make 200 moves each hour, while his opponents needed to make just 20 moves. Albert C. Margolis forced the doctor to lay down his king, while Addlemann, Norris, and Dr. Phillips managed wrestle draws from th ex-champion. Note: I a have a question mark in the title of this post, because I am unsure if these games are in any Lasker database or in Ken Whyld's collection of Lasker games, which I don't have, but which I shall purchase.